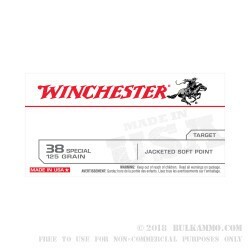 Winchester "white box" ammunition in .38 Special is an accurate, inexpensive target load for .38 SPL and .357 Magnum revolvers. Each cartridge in this 50-round box fires a medium weight 125 grain jacketed soft point bullet at 850 feet per second. The bullet's flat-nosed profile is ideal for target shooting, as it produces more visible holes in paper targets than round-nose projectiles do. This ammo is loaded in Oxford, Mississippi using non-corrosive primers and reloadable brass cases.